I've never been a huge fan of The Cheesecake Factory. Let me clarify before I piss off any die-hard Cheesecake Factory fans (aka my sister). I'll be more than happy to go with you for the cheesecake but I'm not a fan of their regular food menu. One late Friday night, Billy and I were hungry and indecisive as usual. As it was getting later and later, our options went from a few to one. The only place near us that would be open for the next hour was The Cheesecake Factory. While I'm usually cool with dessert for dinner, I was extra hungry and decided to order something a little more savory instead of before cheesecake. I honestly could not remember the last time I ordered anything other than dessert from there, but I did remember the sweet corn tamale cakes being delicious. So I went with that. And what'd ya know?! They were delicious! Saturday morning comes, I wake up and for breakfast I wanted....sweet corn tamale cakes.Then I thought of it the next day. And then the day after that. And then the day after that. Until finally I couldn't take it anymore and decided to try and recreate the taste. I thought dip form would be less work and make better leftovers. 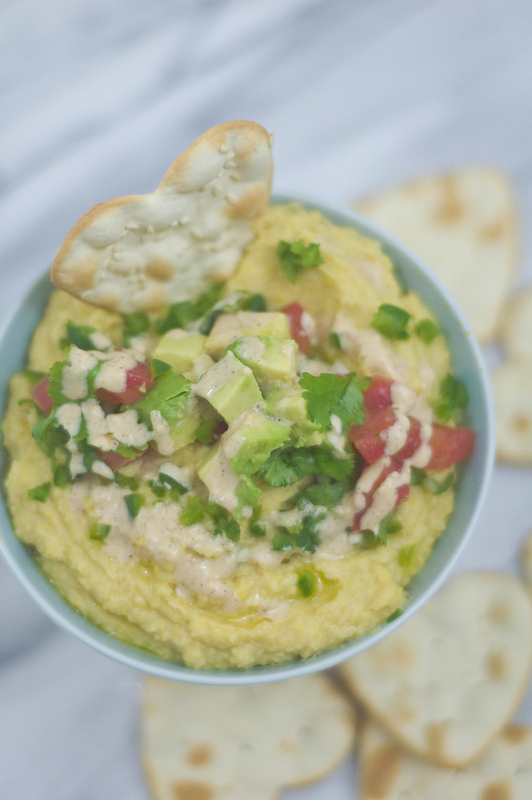 So I ditched the flour and replaced it with fiber & protein rich chickpeas to make hummus. The part of this recipe that had me all kinds of happy was the success of the coconut cream southwestern sauce. The southwestern sauce that the Cheesecake Factory uses to top their cakes is mayo based. I really wanted to keep this vegan and I also did not want to use veganise or any other vegan mayo substitute. When I spotted a can of coconut milk in the back of my fridge, I thought I'd give it a shot. So so so so so good!!! I want to make so many different kinds of coconut cream based sauces now. How have I never made one before?! I think I may write a post solely dedicated to my newly found love of coconut cream dips and sauces. Combine ingredients of the tomato salsa in a small bowl & refrigerate. Pulse chickpeas, corn, and chiles in a food processor until well combined. Slowly add in oil and butter. Season with salt and a dash of pepper. To make the southwestern sauce: whip the coconut cream til light & fluffy and add in seasons & lemon juice. *sorry there are so many "dash of" this & "dash of" that. I like to taste and add to the recipe as necessary* Serve hummus topped with tomato salsa , fresh avocado, any reserved cilantro, and southwestern sauce.